How far would you go to help your pet? A New York man that was charged with theft said that he did it for his cat. The man pleaded guilty to stealing copper pipes from his neighbor’s house to cover his cat’s $1,300 vet bill. The man blames his neighbor for his cat’s injuries because the house has been abandoned for 20 years and is in a dilapidated condition and raccoons are living in the attic. 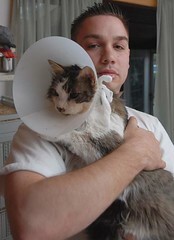 The man’s cat, Frack, was bitten by a raccoon and fell through the ceiling and suffered from an injured eye, broken jaw and an abscess. In the house, the man also found his other cat’s dead body chewed up by a raccoon — he had been missing for a few months. The man felt that what he did was harmless and justified since it was his neighbor’s fault that he had to pay the vet bill to get his cat back. This entry was posted on Thursday, May 17th, 2007 at 9:00 am	and is filed under Cats, National Dog, Cat & Pet Info, New York, News for Cats, Dogs & Owners. You can follow any responses to this entry through the RSS 2.0 feed. Both comments and pings are currently closed. Had he kept his cats inside, they wouldn’t have been able to access the abandoned house in the first place. Negligence doesn’t justify criminal activity. However, that depends on the cat! Not all cats will accept being kept inside. If they have ever been out they want to go out. Keeping such a cat inside is very much akin to keeping cats in cages in my eyes. Stealing the copper pipes was wrong, but justifieable. It’s this guy’s fault for allowing his cat outside. I think it’s total crap and shows horrid responsibility as a pet owner to say that keeping a cat indoors is like caging it. My cat was a stray as a kitten and the ONLY time she’s allowed out is when she is on her harness or her puppy chain and I am with her at all times. The other times are when she’s in her carrier to go to the vet. Kathy, I had friends like you growing up, who let their cats run wild. They heckled me for putting my cat on a chain. In the 18 yrs I had that cat, one of friends had to scrape 2 cats off the street, 1 cat was killed by a raccoon and a 4th disappeared. I’ve had other friends who let their cats out and NEVER KNOW what happene to them. My current cat just turned 7 and she may not like her harness that much, but she knows it’s the ONLY way she’s allowed outside to eat grass and catch bugs and stalk birds. He’s using his cat as an excuse to commit crimes. I hate to say in this case I feel the end justifies the means. The owner of that house is irresponsible to let it go into the condition that it is. The copper pipes would just rot into the earth so at least that kid put it to good use. Personally, I wouldn’t let my cat out if I had one. It’s too dangerous on the streets and the outdoors is not for housepets. Cats are house pets and not wild animals. They shouldn’t roam the streets at will. They should be kept safe, inside. an abandonded house, 1 that the owner neglected? a haven for raccons? both the town ,and property owner are in violation of the law, a safety violation, condemed property? (where was the town board). it could have been your child bitten, or even killed by the raccon? it was this mans cats. one dead the other injured? who is at fault..
will my country please wake up? think how much trouble comes from ignorance on the part of persons who’v “escaped” responsibilty for their communities/country by wealth..
sure the guy’s cat was lose , thats a cat? mine will escape each chance she gets? (i’ve chased the cat almost every day? ) it’s not important..
pet safety.. perhaps a probation for the pipes, and letting his cat run..
it’l happen again maybe with more serious results? drug dealers are selling crack in abandoned houses, children are killed every year by dangerous structures? i live in upstate ny. the town will not allow abandoned homes for long..
property.. and the things that happen their? against cats being outside thats 1 thing? if not , and the town tries to get around the issue of negilgent managment of property? SUE!!! Cats should be kept in side period. You are your cats guardian and are responsible for keeping them safe. So what if your cat “wants” to go out. If your 2 year old child “wanted” to go off roaming by itself would you let it??? Well h3lls b3lls, I’m just glad the guy took his cat to a vet at all. So maybe the vet could’ve compromised on price? Instead of what? Giving it to the pound? What’s the matter with people???? Care comes first. Sheesh. well at least he did somthing for his cat instead of letting it suffer,he took it to the vet .with all the serious crime around and in light of the owner of the house letting it fall apart,i do not find what he did so awful at all ,at least he did the right thing with the money. Having visited some of the wilder parts of NYC years ago I think the pet owner was behaving rather benevolently. He tried to help a kitty. I can’t blame the man for helping his cats. More importantly, an old, abandoned, dilapidated house has copper pipes???? Does it have hardwood floors and granite counter tops too? I donâ€™t condone what the cat owner did, but I am curious what was done with the owner of the property? That place is a hazard. Not just for animals but children. The owner is lucky a child was not hurt and slapped with a huge lawsuit. I am glad though that he did take some action to help his cat. I donâ€™t believe heâ€™s a criminal, just a victim in need due to his neighborâ€™s gross negligence of the property. I would counter sue the owner of the property for damages and negligence.